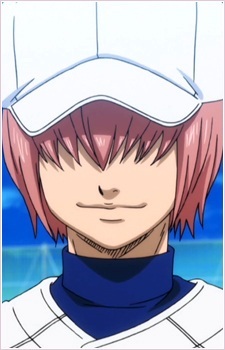 A first-year second baseman of the team, Haruichi is a naturally talented, all-rounder baseball player. Despite his small stature and frail appearance, he has pinpoint precision while batting the ball, able to hit it as wide and as far as he pleases, and control where the ball lands. He also is extremely talented at defense, able to catch a ball in the air and throw it while still floating. He is often noted to have amazing baseball sense, able to decide in a split second where to hit the ball, what to watch for, and when to steal. His ability in baseball exceeds his older brother's, Ryousuke Kominato, who is first-string player and also a second baseman. The only thing lacking is his stamina, which he works hard on improving. Born in the Kanagawa Prefecture, he is a very calm and quiet person, often acting as tsukkomi to Sawamura Eijun's boke. He has a habit of saying things bluntly and often praises either Furuya or Eijun, causing them to compete against each other frequently. He plays reserve in the first-string team and occasionally feels envious of Eijun and Furuya for being able to play in a match. He is very small compared to other boys and it has been noted that he looks a bit like a girl. He is easily embarrassed, especially when praised. His relationship with his brother is slightly strained because they play the same position, but he still admires him to no end. Though reserved, he is highly ambitious and aims to take his brother's position. When he was a child, their relationship was closer, with Ryousuke often protecting him from bullies. In Diamond no Ace: Second Season Episode 17, we ask the question: With aces like these, who needs scrubs?